April is Autism Awareness Month: Well, for some of us every month is Autism Awareness Month. But I am all for people learning more about how ASD minds work and what programs work for ASD minds. Thursday, April 2nd, Nicole Hitchcock has organized Bay Area Autism Awareness Day. Temple Grandin and Congressman Jared Huffman will be speaking, and a month-long art exhibit will be launched. The event will begin at 6:00 pm with the art display at the NH2 Salon in Vintage Oaks shopping center in Novato. Then continue at 7:30 pm at HopMonk Tavern to hear the guest speakers. Several of our Autistry students will have beautifully mounted photos of their projects for sale. So, come down, see the art, hear the speakers, and support local ASD programs! And talking about support for local ASD programs: The Jonathan and Kathleen Altman Foundation will match all contributions to Autistry Studios in the month of April, up to a maximum of $20,000! I took this photo the other day of a plant growing in our back yard. For the last couple of weeks I have watched this plant slowly push aside the rock that was in its way. Inch by inch it has worked its way around the obstacles and continued to grow. I know how it feels! Seven years ago we started Autistry Studios and we continue to grow – inch by inch. Building a nonprofit program is a lesson in patience, persistence, and partnership. Your donation is crucial to help us meet the Altmans’ challenge and sustain the growth of Autistry. Scientists and Artists…Party IV: Yes, it’s back! Our favorite Autistry party will be Saturday, April 11th, at 7 pm. Don’t miss the great presentations by Brian Kennedy of the Buck Institute, with Eli Pilcher and Ross Jacobs, Autistry students who will share their Buck internship experiences. Natalie Mann of the The Walt Disney Family Museum will give a cool presentation on animation. Ken Pontac, screenwriter and animation director, will talk about his latest and greatest adventures in Hollywood. Angelique Benicio, artist and sculptor, will show highlights from her very popular Autistry Orisha Workshop – freeing the spirit within. And, it wouldn’t be a party without Greg Nett and his fabulous Karaoke Machine. Join us for lots of fun. Summer is coming! We just posted our 2015 Summer Camp schedule. Last year was so much fun we just had to do it again. 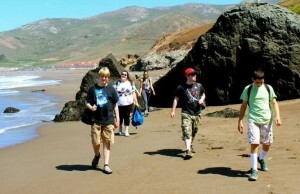 This year we are offering 5 week-long camps – Cooking I and II, City Explorers I and II, and Hero’s Journey. Camp sessions are 10 am – 3 pm, Monday through Friday (except Cooking I, which is just 4 days). Sign up early as we keep the groups small to ensure a great time is had by all. Enrollment deadline is May 8, 2015. * Brian Kennedy, President and CEO of the Buck Institute, will give an overview of the research happening at the Buck. He will also introduce Ross Jacobs and Eli Pilcher. Ross and Eli are both Autistry clients and have recently completed successful internships at the Buck. They will talk about their work experience. *Ken Pontac will entertain us with his fabulous stories as a writer on Happy Tree Friends, Pac-Man and the Ghostly Adventures, Arthur, and many other film and TV projects. *Angelique Benicio, local painter and sculptor, will present the cool creations made in the March special costume workshop by the Autistry students. 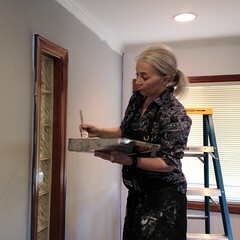 Angelique is one of several local artists who provide inspiration and hands-on seminars at the studio. 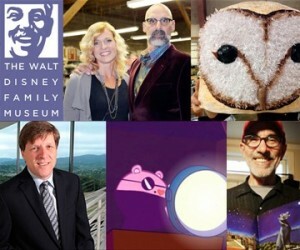 *Natalie Mann, Outreach Program Manager of the Walt Disney Family Museum, will speak about their Animation Access Program and give a demonstration on creating animation. She is also bringing an ‘animation station’ for a hands-on demo! * And the fabulous Autistry Student Projects will be on display! Autistry Digital Arts Studio: Yes! Thanks to a generous grant from the Feshbach family, we are creating a digital arts studio at Autistry. The downstairs conference room is being transformed – new carpet, fresh paint, 5 workstations, a 60″ monitor for screening, and state-of-the-art design and animation software. The new studio provides yet another ‘toolset’ for our students. We are also working closely with local animation and digital arts professionals who have helped us with the design – both physical and virtual – of this studio. Many of these professionals will be giving seminars to our students throughout the year, answering questions and sharing their career experiences. Productive partnering: You may have seen the IMAGINE tile on our Facebook page. And, yes, we loved John Lennon but we also love Buddy Rhodes! Buddy is recognized as a pioneer in the use and creation of decorative concrete. We will be working with Buddy and the students of Oak Hill School to create “message tiles”. 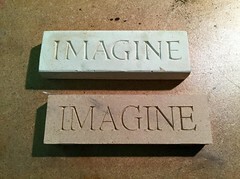 We will carve the master blocks on the ShopBot, make rubber molds, and then pour in Buddy’s special concrete mixture. Imagine all the messages…it’s easy if you try! Testing…hello…hello…testing: Starting this summer the Autistry staff will offer ASD assessment and diagnostic testing. Tests include: Vineland II, Autism Diagnostic Interview™, Revised (ADI™-R); Checklist for Autism Spectrum Disorder (CASD); and The Autistry Studios Life Skills Inventory (based on the inventory developed by Washington State Department of Social and Health Services). Besides giving families information about their child (and individuals information about themselves), performing these evaluations on a regular basis will provide us valuable insight into the efficacy of the Autistry program. We have collected wonderful anecdotal reports on how Project-Based Therapy has helped teens and adults become more resilient, self-reliant, and independent, but having standardized measures will help us fine-tune our approach and highlight areas that need more concentration. March 14th – Congratulations to Marin (Rinny) Xiques, Jon Wootton, Connor Barbee, April Evans, and Alex Phillips—all five of these Autistry students submitted photographs of their artwork to Art Slam 2015 and were accepted. A slide show of their work and many others will be shown during Art Slam at the de Young Museum on March 14. For free admission to the de Young that day, RSVP by this coming Wednesday, March 11, to access@famsf.org or (415) 750-7645. Connor’s photograph will be shown in the Koret Auditorium during Presentation #2 at approximately 1:09–1:16 pm. The other four will be shown during Presentation #4, around 1:25–1:32 pm. March 19 – Autistry Support Network meeting. 7pm at Autistry Studios. Topic: Transition. Guest Speaker: Jacob Lapides from Integrated Community Services. Jacob will be speaking and answering questions about employment training and opportunities for ASD individuals. March 20 – Due date to have your Autistry student’s artwork photographed for the Bay Area Autism Awareness day event in Novato. Please contact Sarah Horowitz for more details.